You made it through the first round and (we hope) have not walked into walls while playing this crazy game. We now head right into the second part of our fun comparison article. There isn't much really to say about it. Welcome to Part 2 of Poke'- Pens. Bryan Rust: Usually I (Medina) classify Bryan Rust as the Tasmanian Devil but for this article we had to find a Pokémon, not a Looney Toon. One that is fast, agile, and has hands (or claws) that can inflict the most damage. It also had to be a Pokémon who has a tough exterior and a lot of heart. No other character embodies these attributes than a Sandslash. Evgeni Malkin: The fan-dubbed "Russian Bear" is a favorite within Penguin Nation. Picking the appropriate Pokémon was a must, however it did not take very long. 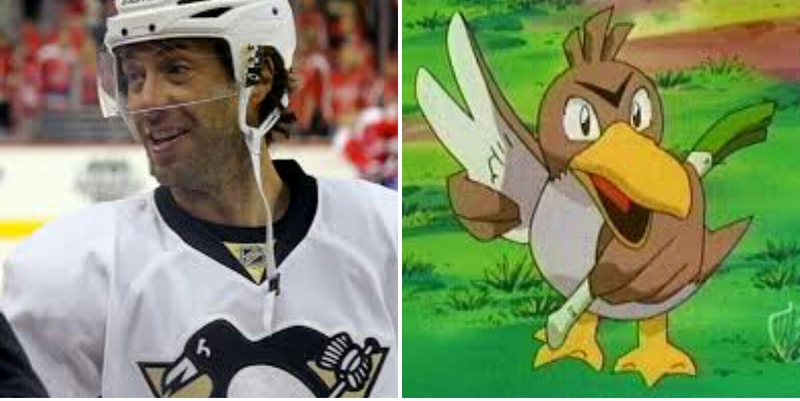 There is only one Pokemon that could do our Russian star, Evgeni Malkin, any justice. 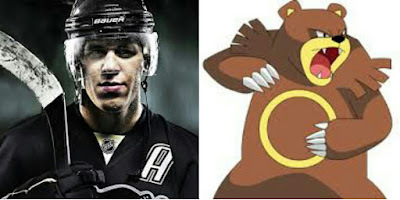 Malkin is the mighty bear Pokémon, Ersaring. Ersaring are only aggressive when provoked, a character trait shared with Evgeni Malkin. Another is their size and speed. Both the skater and (fictional) bear will use these in order to attack their prey and capitalize on weaknesses. Ersaring are also very protective of their young which is very fitting for this new dad. The rule still stands- do not tick off the Russian/Pokémon Bear unless you are prepared to deal with the consequences. Chris Kunitz: We changed Chris Kunitz's selected Pokémon 3 times before finalizing it. While players like Kunitz are common, when trained properly they can be a huge asset and a powerful force within a team. Paired with the right centerman (Sideny Crosby), he becomes a dependable and stellar line-mate as well as protective one. Kunitz is not afraid to get in someone's face if you mess with his captain. It was only fitting to make him a Zubat for all of those reasons. Tom Kuhnackl: This German grinder started out a tough yet humble shell. He could score but had no real movement in any other area of his game. Kuhnhackl begins as a Kakuna...a pupa stage Pokémon in the midst of evolution (yes, the play on names was too much to resist). When the time was right, Kuhnhackl cracked his shell and evolved into the deadly Beedrill. An asset on the penalty kill shows him to be very territorial, and his quick attacks for short handed goals are all shared traits of a Beedrill. 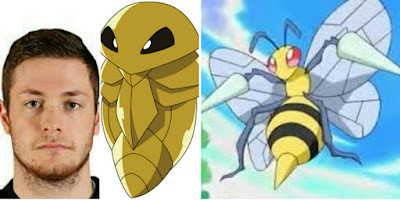 Beedrill are also known to attack as a group, so when Kuhnhackl comes down the wing with Cullen or Fehr (or both) in tow, it can be too much of a sting for a goalie to handle. Matt Cullen: The team dad is another fan favouite. While we all wait on baited breath to see if he will remain with the Penguins, we can relive his incredible season. Cullen is, indeed, a rarity amongst hockey players. At his age, he continues to play as though he were ten years younger. He is a veteran who leads by example. He was called upon to fill many roles and like a mighty knight galloping in to save the day, he brandished his stick as a sword in battle scoring goals at the most opportune times. For a man 39-years of age to play as he has this past season in the NHL (in this day in age) is truly unbelievable, or, Farfetched. 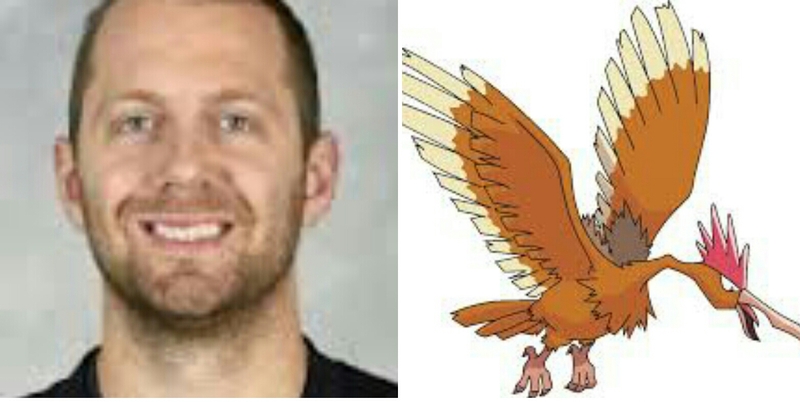 Eric Fehr: Yet another play on words (seriously, we could not help ourselves), Eric Fehr is denoted as being the flying bird Pokémon, Fearow. Fehr will swoop in for a pass without warning. Both he and Fearow possess extreme amounts of stamina and are considerably larger than the roles. 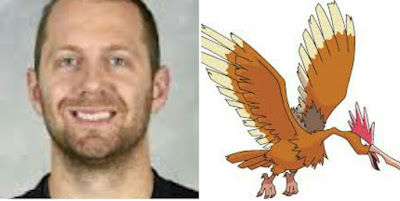 Speaking of being larger, Fearow is one of the bigger bird-type Pokémon and Fehr stands at a towering 6-foot, 4-inches. Neither are one you want to get pecked by. He is on a line with both Cullen and Kuhnackl. It is indeed a special line those three Poke'-Pens make up. Kris Letang: Long, flowing, luxurious locks of hair, a fluffy crest atop the head...and a vengeful attitude that will see you cursed for 1000 years if you brutalize it or get on it's bad side. 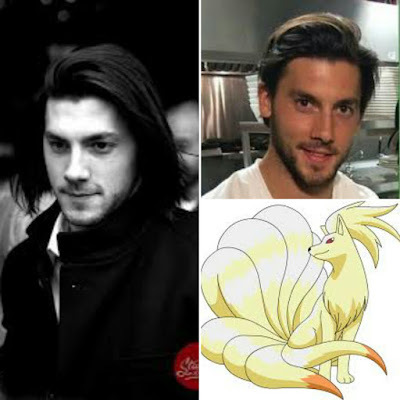 I not only speak of the Pokémon, Ninetales, but also of defenseman Kris Letang. Both share these similar attributes. Both are also very cunning, swift-footed and intelligent. It is said that Ninetales' eyes can control minds...this might be how Letang is able to get into the heads of opponents and goalies so well. Trevor Daley: A Doldrio possess many personalities all of which want to take center stage. It can change from being happy, to upset, to angry at the drop of a hat. With it's high endurance it is able to withstand lengthy battles and its intelligence (having three brains and all) allows it to execute complex strategies with ease. We have a defenseman like that...his name is Trevor Daley. Ian Cole: He has a fantastic ginger beard and a feisty attitude thus we wanted to honor this defenseman accordingly. There are few Pokémon who are predominantly red and have the same complimentary personality to Ian Cole. There is one that came to mind and that is Krabby, a water-type Pokémon. 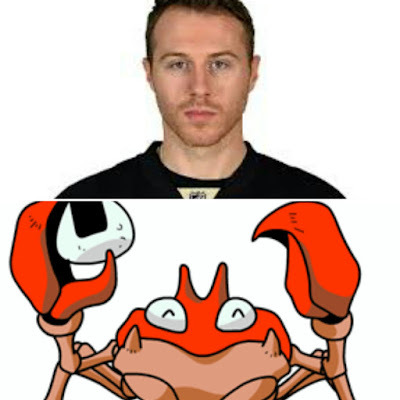 Like Cole, a Krabby is extremely defensive when protecting its "home"(Consol Energy Center). It is also very protective of others and aggressive when needed. I guess being a Krab(by) pays off every once in a while. Matt Murray: Matt Murray can be described as long, thin, and very flexible. He is a pain to try and score on because of his size and ability to stretch out across the goal mouth. He is very much a Bell Sprout, the baby flower Pokémon (yes, we said it). He is able to swerve rapidly just as a Bell Sprout does in order to defend his net and is able to capture prey (using his glove hand) with blinding speed (prey being a puck). A Bell Sprout evolves into the massive and intimidating Victoribell and, with a little more time, we all know more victories will come to Matt Murray. 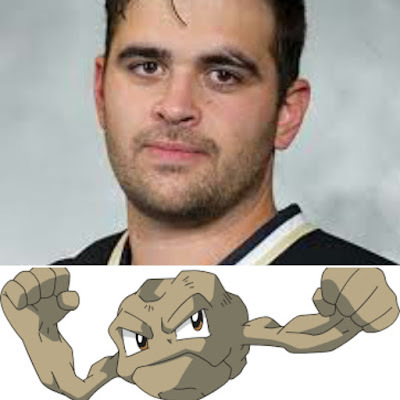 Tom Sestito: This tough as nails hockey player falls into one two categories of Poke-types: rock and fighting. He is solid and steadfast and will drop the gloves when the need arises. Sestito has a lot of heart and a lot of guts but can really pack a punch. He is also sturdy, which is a special attack of the Pokémon, Geodude. Tom Sestitio is a player you are glad to have on your side when things get chippy. 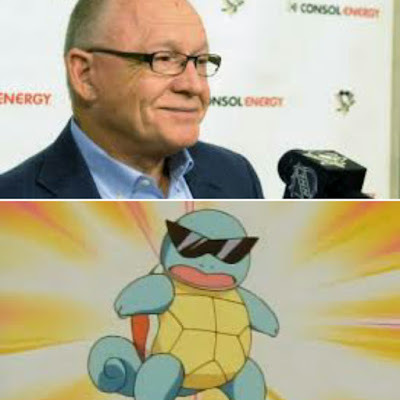 Jim Rutherford: Rounding out our Pokémon piece is the man who brought this team together. The man pulling the strings. The head honcho in the front office (besides Mario). He is very organized and efficient. A smug leader with a lot of brass and some sass. He also slightly resembles what he is about to be compared to. Jim Rutherford is Squirtle and leader of the Squirtle Squad. We hope you have enjoyed these fun articles. Happy Poke-hunting and please, watch where you are going. It's funny, thank you for sharing.